Voted as One of Canada's Top Ten Best New Restaurant in 2008 by enRoute magazine and the Best New Restaurant in 2008 by Toronto Life Magazine, Lucien is quite impressive on paper. Although it has been almost three and a half years since then and a lot of things can change during this time, Lucien remained on my list of places to try in the city because I wanted to see what the hype was about...back in 2008. I say it this way because I'm not sure if it's just me but I feel like Lucien has fallen off the grid somewhat. I never hear anybody talk about Lucien anymore...like ever. People know it's still there but the restaurant itself is just so...quiet. Lucien was certainly really quiet, literally, when my boyfriend and I went about a month ago on a Saturday night around 6:30pm. Given, Buskerfest was going on right outside the restaurant so I'm sure that detered some diners as a lot of the streets were closed off. There were only 2-3 tables when we arrived. The restaurant is long with the bar taking up most of the space on the right with seating on the left and the kitchen at the back. The large mirror at the bar tries to open up the narrow space. The dark brown wooden floor, bar stools, chairs and tables, with deep dark red curtains and black screen was just all a bit too gloomy for me (I tend to like cozy places). I don't like wooden floors at a restaurant either but that's just me. The pretty chandeliers gave the room a bit more warmth. Lucien has a tasting menu but it was a bit too pricey for us, especially because we weren't there for a special occasion. Brioche and bread sticks. I like the variety. Bincho Grilled Octopus - fingerling potato, house-made chroizo, pimento, arugula, olive ($17) - I thought it was really unique and pretty with the octopus sliced so thinly at the bottom as I've never seen octopus presented this way before. The overall dish is very light in terms of flavours, if anything the only really savoury thing on the dish was the chorizo but it was still good since I could really taste the actual octopus. See how Chef Scot Woods of Lucien prepares this appetizer. Berkshire Pork Belly - Kimchee, clam, cuttlefish, barley, sweet soy ($13) - The fatty pork belly was absolutely lovely (maybe a bit too fatty for some but perfect for me) and with the kimchee, it reminded me of the Chinese dish "Braised pork belly with preserved vegetables". This tasted like a fancier version of it. Yellowfin Tuna - Heirloom beets, corned beef, pumpernickel, mustard, mache ($32) - The colours on the plate and the presentation was quite stunning like a piece of artwork. Although beautiful, I didn't really like it. The tuna was great; deep red in the centre, moist, with a thick cut. However, it's everything else on the plate I didn't like..I felt like it was just random stuff put on the plate and nothing went well together. I thought the whole entrée lacked focus and was all over the place...literally. I did not care for the tuna + corned beef + mustard combination at all. Ontario Veal Ribeye - Baby leeks, avgolemono, black truffle ($34) - My boyfriend had this and he didn't say much about it. He ordered medium rare but it came out a bit grey, which may be because of the weird lighting coming in. I asked him afterwards what he thought of it and he told me it was just OK, nothing special at all. I tried a small piece of the veal too and it was easily forgettable - not as juicy or tender as I would like it. I had no desire to stay for dessert. To be honest, I wanted dessert but nothing on their dessert menu appealed to me. I actually had a crazy craving for soft serve instead so that's exactly what I got: a vanilla and chocolate soft serve from an ice cream truck at Buskerfest that was the size of my head. I walked around with it and people stared and laughed at me. Not kidding. Everything that came out of Lucien's kitchen was beautiful; all the dishes were very well composed and you can tell that a lot of care was put into each and every single element. 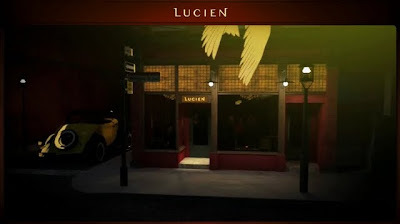 But at the end of the day, Lucien did not impress me - given such a high price point, the food tasted really mediocre and boring. I specifically remember that each time a dish was placed on our table, I would be blown away by the outstanding presentation but after taking the first bite, none of the dishes tasted as good as it looked. I felt that each dish had so much potential to be something more but it just doesn't come together at the end. It certainly didn't help that the restaurant was so dead and quiet on a Saturday night - the dark decor and lack of vibe just made the whole place really depressing. I'm still glad I went as I can finally strike Lucien off the "On My Radar" list. I don't think I'll be going back any time soon. One last thing: I hate their website.